I have a weakness for Nutella. I can’t keep a jar of it in the house or I end up eating half of the jar with just a spoon. A little here, a little there, before I know it half the jar is gone. Sometimes I can’t help myself when I find myself at the grocery store and a I see a lonely jar of Nutella on the shelf. I know it is just destined to come home with me. I just better put it under lock and key or I’m in trouble. I love Nutella for many things. Sometimes as a little snack, I will spread a little Nutella on a flour tortilla and wrap it up with a banana. It is so good like that! My Nutella Brownies are wildy popular. Thank you so much for the continued positive feedback on that recipe. I am so thrilled that everyone love those. If you haven’t tried those yet, those are a must try. They may quickly become your new favorite brownie. 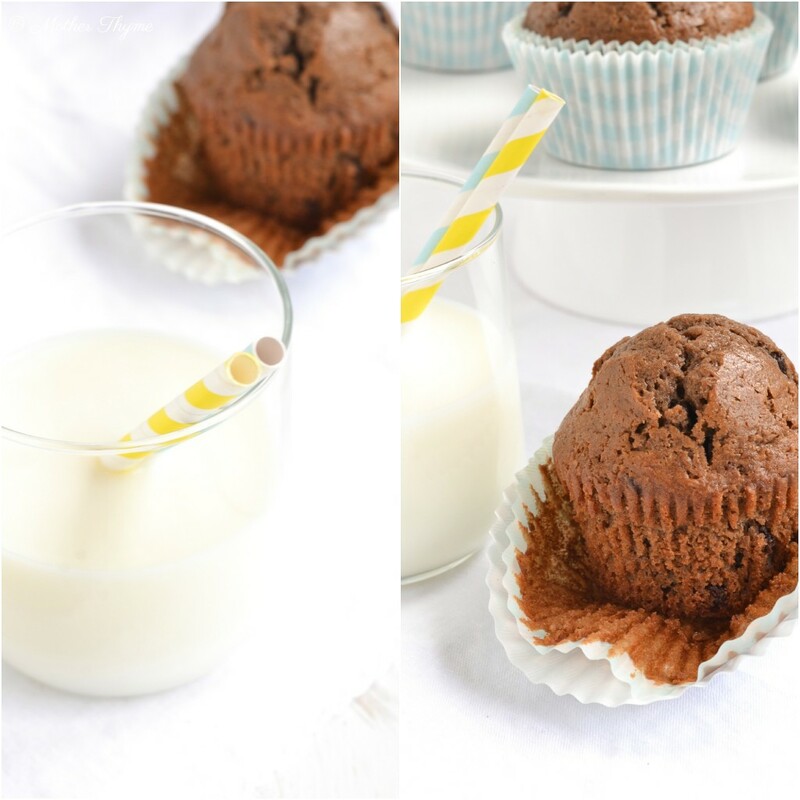 These Nutella Muffins may become a new favorite of yours as well. They are light, moist and delicious served warm alone or even spread with a little strawberry preserves. Try them even as a dessert with a little vanilla ice cream. You may also pop them in the freezer so you have some on hand anytime the urge for one hits. They thaw quickly in the microwave or even just sitting on the counter. Preheat oven to 400 degrees Fahrenheit. Line a 12 cup muffin pan with liners or spray with cooking spray and set aside. In a large bowl mix flour, baking powder, baking soda and salt and set aside. In another large bowl, stir butter and sugar until combined. Stir in eggs one at a time. Stir in milk followed by Nutella until mixture is smooth. Gradually stir in flour mixture into wet ingredients until combined. Stir in chocolate chips. Pour batter about ¾ full in prepared muffin pan. Bake for 18-20 minutes until cake tester comes out out clean. Cool in pan for about 5 minutes. Serve warm or transfer to a wire rack to cool completely. An early release of Summer Thyme is now available! Click on the book cover for a sneak peak and to grab your early release copy! 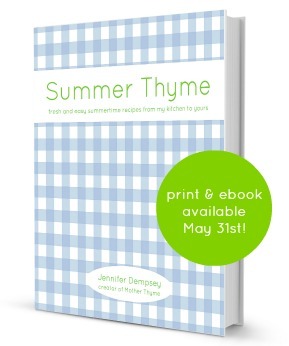 Later this week there is some great things happening that I can’t wait to share with you along with the full launch of Summer Thyme including fun giveaways! I love Nutella, these muffins look fab! How delicious Jen! I can almost smell Nutella just looking at these! I love the height on these! They’re perfect! I have been known to enjoy Nutella with a spoon. I can’t keep it around! I know I would love these muffins. I am seriously dying over these!! You have a beautiful site!! Beautiful photos!!! I’m a new fan/reader! Will let you know about the result!! I’m sorry, I don’t have the conversion of how many grams. Sorry that needs to be “how” many…. oops! do you need the chocolate chips? Hi Kat, you don’t need the chocolate chips in these muffins. Enjoy! I just made these following the recipe exactly and they came out PERFECT, and I am not a baker by any means. These were the first muffins I’d ever made. Thanks for posting this – delicious! Hi Michelle! So glad you enjoyed these muffins! Hi do you know the calorie count on these muffins? thx! Hi Chris, Sorry I don’t have the nutritional information for these muffins. Not bad but the texture comes out pretty weird because of the nutella. Not fluffy but more sponge-like and dense. Almost feels a bit uncooked and batter-like in the middle when the bottom is definitely well done. Definitely wait for them to cool before you try to eat them as otherwise the gooey part will stick and you won’t get much of the muffin. The flavor is incredible though! You can cut out some of the sugar and it still tastes great. Does it have to be low fat milk? can i use regular milk? Yes, you can definitely use regular milk. Enjoy! 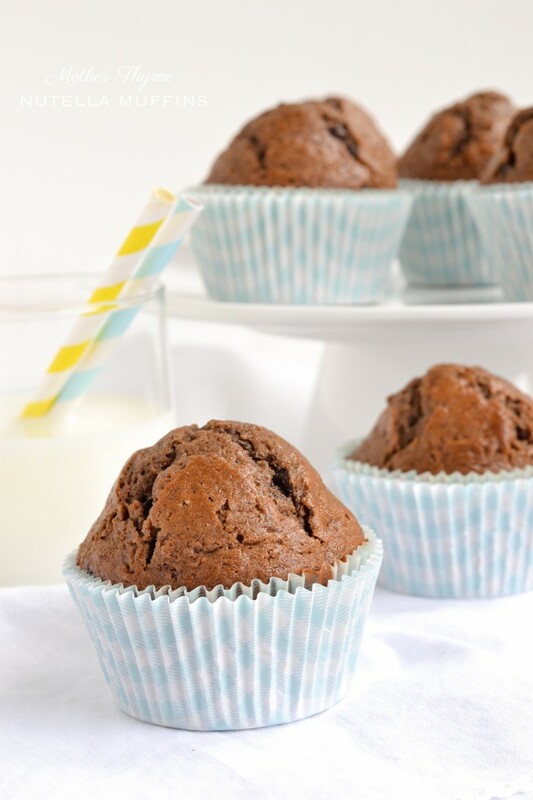 These taste great just as chocolate muffins, but my family and I don’t taste any Nutella or hazelnut, even though I halved the chocolate chips. Great texture and they look incredible! I wish they had more Nutella flavor. 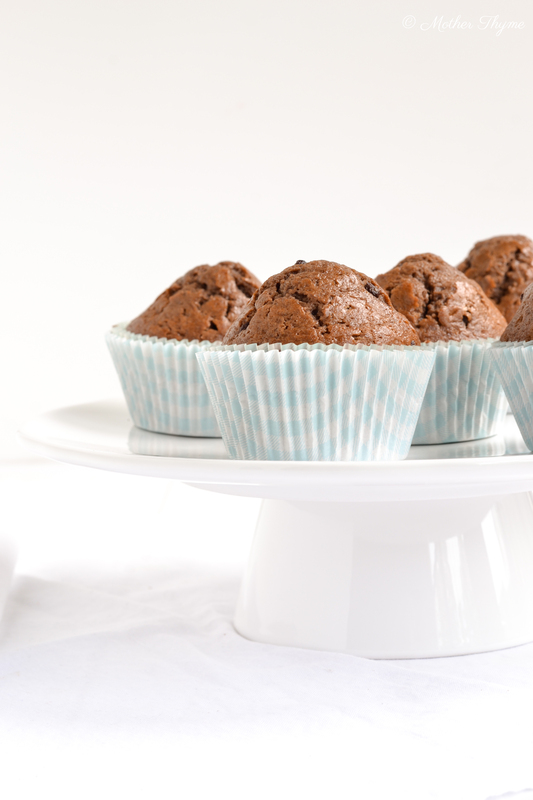 Those muffins are amazing and so easy to make! Being a university student with limited time and a weakness for sweet things, those muffins are a lifesaver!! Thank you so much! Wonderful recipe! Hi, when I mix in the flour into the wet mixture, the flour did not completely dissolve into the wet mixture there are tiny lumps. Is it normal? Hi, The batter may be a little lumpy but the flour should definitely dissolve. Hi Sophie, Unfortunately I have not tested this recipe to be baked at a lower temperature so unfortunately I can’t tell you how these would turn out if baked at 350 for 25 minutes. It might be worth a try! Let me know how it turns out if you give it a try. Hi, I just want to know if I can replace the All- purpose flour by whole flour, thanks!